Colorado releases recreational and medical marijuana data for March, a notable ancillary cannabis firm wins big and a Canadian company makes grand claims. Demand for recreational marijuana continues to balloon in Colorado, despite worries that sales would subside after the initial boom in January. As we reported earlier this week, retail stores posted nearly $20 million in revenues in March, up 30% from February. The industry is now on track to generate $200 million in revenues in 2014 – but the actual year-end tally could be much higher if the industry continues to expand at the current pace. The industry will likely see an even bigger increase in April, as many cannabis businesses reported record sales tied to the 4/20 cannabis holiday. While the numbers are encouraging, there’s another data point worth noting: medical marijuana sales actually fell in March. It’s a somewhat surprising development. Dispensary revenues in Colorado have been surging in recent years, and the trend held up initially when the recreational market emerged. 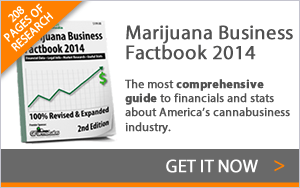 In February, for instance, MMJ sales rose 12% over the previous month to hit $35.2 million. But the tide turned in March, when sales fell to $34.5 million – a bigger dip than it appears given that there were actually more days in the month than in February. It will be interesting to see how the recreational market affects medical cannabis sales as the market matures. The MMJ market may very well have hit a plateau, but it should remain relatively strong because medical cannabis is much cheaper than recreational marijuana due to taxes. By the end of the year, however, we wouldn’t be surprised if retail sales match or even outpace medical revenues. Regardless, there’s no question that marijuana in general is a big business in Colorado: Combined, medical cannabis dispensaries and retail stores have hauled in $150 million in revenue through the first three months of the year, netting the state more than $20 million in taxes, licensing and application fees. Leafly is already a well-known name in the cannabis industry – now it’s making name for itself in the tech world, too. The company was named App of the Year by GeekWire.com, a prominent mainstream tech publication in the Pacific Northwest. And get this: Microsoft’s Office app for the iPad was a finalist, as were offerings by several other tech companies focused on more traditional markets. This is a pretty big achievement not only for Leafly but also for the cannabis industry as a whole. An award like this further legitimizes cannabis as a real business and chips away at the stereotypes that surround the industry. And the fact that Seattle-based Leafly beat out Microsoft for the award – right in the software giant’s backyard, no less – shows just how far the marijuana industry has come in recent years. Announcing that your company is going to become the cannabis industry’s version of a huge, well-known brand is an interesting marketing tactic that can build hype…or backfire by creating skepticism. This week, a Canadian company run by Olympic snowboarding gold medalist Ross Rebagliati said it intends to become the “Amazon” of medical marijuana by essentially distributing cannabis from licensed growers around the county. While it sounds impressive on paper, some people are turned off by the bold claims. – When Jamen Shively – a former Microsoft executive – announced his intentions to build a chain of marijuana stores in Washington and Colorado, he drew comparisons to Starbucks. The media ran with it, saying he aims to create the “Starbucks of marijuana.” Shively also said he was going to “mint more millionaires than Microsoft,” leading some to call him “the Bill Gates of cannabis.” It should be noted that his plan was widely criticized as being too grandiose and out-of-touch with the realities of the cannabis industry. – A story about Medicine Man – a recreational and medical cannabis shop in Colorado – said the company is trying to become “the Costco of weed.” It’s unclear if the company brought up the discount club chain itself or if the newspaper made the comparison on its own. It remains to be seen if Medicine Man will ever reach those heights – at least as far as the Colorado market is concerned – but it’s certainly one of the most successful cannabis stores in the state. – Several years ago, cultivation equipment retailer weGrow that billed itself as the “Wal-Mart of weed” made waves as it opened several stores across the country, gaining a ton of media attention along the way. Fast-forward to 2014, and the company most certainly is not the Wal-Mart of weed. It’s unclear how many stores there are – the website doesn’t offer up a list, and the latest entry in its press release section is from 2012. WeGrow’s founder also was sentenced to five years of probation for defrauding the city of Oakland.